Each patch may have a list of up to 128 names for notes. Usually, note names are labels for percussion instruments. For example, the pitch C3 may really be “Kick Drum,” and D3 may be “Snare.” Because a drum machine may provide different drum kits for each patch, Cakewalk lets you specify a different list of note names for each patch. The Piano Roll and Event List views show you these note names. Cakewalk displays the updated patch and note name lists. 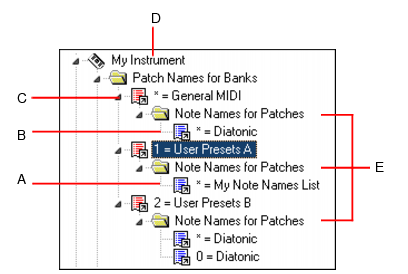 If necessary, Cakewalk adds a new patch to the instrument definition.